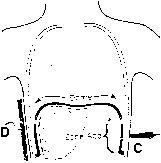 Dome is usually better than the left because of the underlying liver, in contrast to the gastric and intestinal gas adjacent to the left dome. Diaphragm displacement measured by these techniques compares favorably with simultaneous fluoroscopic estimates (18), but the diaphragm is shown as a brightly echogenic arc with poorly defined borders whose thickness can be as much as 10 mm the pleural and peritoneal membranes cannot be distinguished. In this application a 3.5-MHz vector transducer with considerable penetration but lower resolution is used in the time-motion mode (M-mode).